Easy vinyl lettering ordering, compare font styles, and customize online with an instant design preview. Vinyl lettering comes pre-spaced and super easy to apply. Free shipping with $50 order, same day production, and 100% installation guarantee. Available on orders placed before 1:00pm EST. You can apply our vinyl lettering yourself—Guaranteed! 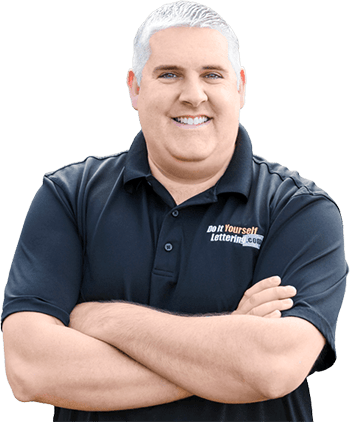 Save money and get the same professional results. "I absolutely love DIY Lettering. It is so easy and convenient. The truck looks like it was professionally done. It took less than ten minutes to put the lettering on the truck." "The website was very easy to use and the letters went on very easily. I will never pay someone else to do my lettering again. Very satisfied with the product, service, and ease of installation." "Low prices, extremely quick turnaround time and shipping, and awesome customer service. Very happy with how the vinyls turned out. I've already referred two friends! Thanks so much!" Your lettering will install perfectly, or I'll send you a free replacement. "Great product. I have already had 2 people call about my services just from the lettering. Thank you." "This is a superb solution for advertising on the go. Thousands of people see my photography website displayed on my van..."
"Your letters were great! Very cost effective"
"The letters shipped quickly and were easy to apply. Thank you, I saved a LOT of money doing it myself!" "Top quality vinyl, I not only didn't have any problem installing the letters (even as a beginner), but it looks like a professional did it. I saved myself about $1400 dollars. Couldn't be happier. A tape measure and a little masking tape... who would have thought." "I did this for a huge commercial property at an indoor trampoline park, to save time on painting the words in along with my other hand painted murals. This way saved a lot of time, and I love the outcome!" You'll need to submit a quote request for custom graphics. Use the stock image search on the quote request form. Let us know what size, how many you'd like, and any other details too. You can also upload your own graphic images. Vinyl Lettering is a self-adhesive product made from durable vinyl material for sign making. 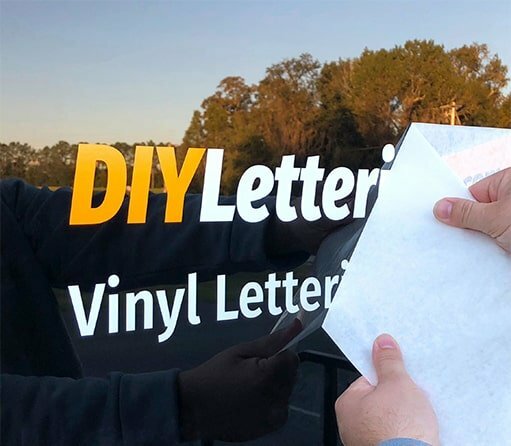 Use Do-It-Yourself (DIY) vinyl lettering to advertise your store information, or create a customized message for your sign or vehicle. They're available in many font styles and colors and can easily be applied to any smooth surface. Three ways to order vinyl lettering.